Just over one year ago, I discovered the very first blog that I felt I could personally connect with. The Traveling Bird was a blogger who I felt like I could relate to and I admired each of the stories she had posted about which included interesting and fun subjects, like bubble tea, and stories of her travels to places that I had always desperately wanted to go, like the Shanghai Expo of 2010. 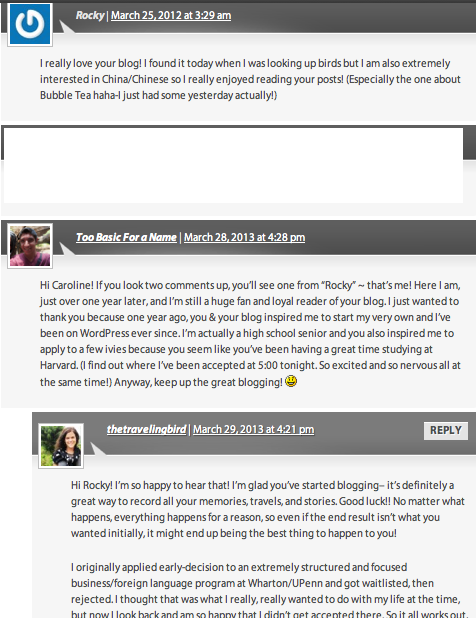 One year later, I am now an active blogger on WordPress and I have learned to love the community. I’m naturally drawn to people who are dedicated to their work and passionate about the things they do and those are the exact type of people that I’ve had the luck of meeting here in the WordPress community. Caroline, thank you for inspiring me to become a part of this!